When it comes to drinking alcohol, especially with your high-stress career and the responsibilities of family, finding yourself winding down with a drink at the end of each day is probably nothing new. I know I did this myself for years, and it started to show in how I was feeling… and on the scales too. You don’t have to be an alcoholic to feel the effects of drinking. Even if you have two glasses of wine an evening, you will be shocked at how differently you feel when you give it up. My work revolves around being connected to your body fully when it comes to eating and exercising. You’ve heard me talk about food drama on the podcast before, but we do the exact same thing when it comes to alcohol. Well, this week, I have a very special guest on the show to talk about how alcohol really affects our wellness, and exactly how you can start to change your drinking habits. Join master certified coach Rachel Hart, host of the Take a Break from Drinking podcast, and me in my very first broadcast interview as we discuss how we fall into the habit of drinking, why our brain loves a drink, and what thoughts we’re having that contribute to our reluctance to try and kick the habit. How to challenge your views about when and how much you are drinking. 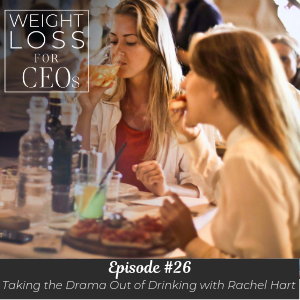 Why Rachel believes managing your drinking is the key to managing your emotional health. How alcohol consumption, despite not being an alcoholic, forces your brain into habits. Why consuming alcohol is not making you feel better. How to apply some of my lessons around mindful eating to how you drink. The feelings that using mindfulness over sheer willpower can help uncover. What we tell ourselves alcohol gives us the permission to do, and how to overcome that behavior. Well, good morning, listeners. I have a really cool surprise for you, and I am interviewing one of my favorite coaches, Rachel Hart. And she was kind of ahead of me on the podcast game and one of those women that I followed when I started designing my podcast. And we are both coaches from the same school with Brook Castillo. Rachel, just to introduce her, she is a master certified coach and the host of Take a Break podcast. So you have another podcast you can listen to. And she teaches women how to stop overdrinking and go in pursuit of a life that blows their mind. Diana: So, good morning, Rachel, welcome to the show. Diana: So, the reason I brought you on, and we talked about this a little bit before, is this podcast is going to plop right in after stress. And in fact, in the local area in Atlanta, I do stress workshops, but I start them with a bourbon tasting. So this is a little ironic because I know, what most of us do, is lean into alcohol when we are feeling stressed. So I feel like this is kind of a place to start, but I think there’s a lot more that you can help us and offer. And I do feel like I just know that, for me and for my listeners and clients, that alcohol is a huge disruptor in our wellness, for so many reasons. And I think they need your help in unpacking this a little bit and taking what I call a bold move in looking at this area, the way that we treat alcohol. So can you share with us a little bit of your story and why this is even the core, or kind of the entry point, for your coaching practice? Rachel: Definitely, I think that this issue is so overlooked because, in society, we have this idea that there are, quote en quote, normal drinkers, and then there are alcoholics and there’s nothing in between. And the fact of the matter is there are many different degrees of struggle. There are many different ways in which people use alcohol. And I think that there’s not a lot of resources out there for people who are truly functioning, but like you said, maybe they have a lot of stress in their life or a lot of anxiety and they find themselves getting into this pattern of using a drink at the end of the day to take the edge off. And so it feels like a no-win situation because I don’t think we really give people tools for what to do or how the brain works or how to understand how it is they ended up in this place. And so, to me, really being able to change your drinking, I think, is the foundation of learning how to manage your mind and your stress and manage all your emotions. Diana: Oh, it’s so great, and it is the window I deal with with overeating with my clients. And it really is very, very similar, but I don’t think – and I think, because there’s a societal facet of this, like if you’re at a three-day conference, there are always cocktail hours, so it seems like it’s separate, but it really is very, very similar on needing to manage your mind around that deprivation piece. Rachel: Definitely, and you know, before I became a coach, I actually worked for a human rights organization that had me flying all over the world, I was traveling internationally once a month, I was leading training, I was constantly networking and meeting people in new countries. And alcohol became kind of every step of that journey. I was living in New York City at the time. It was going to JFK or going to Newark and finally making it through security and coming straight from work, and it was like, “Okay, so I can go to the lounge and have a glass of wine.” And then it was flying across the ocean and getting a little stressed or feeling anxious because of turbulence, and, “Oh, okay, now I can have a glass of wine.” And the meals I had in hotels by myself or the networking that I did with people, alcohol was just so infused in so many parts of my career in ways that, when I started drinking when I was in college, it wasn’t about work. It was about having a good time. But in my 30s, it definitely became this is how I kind of reward myself and take the edge off from all the stress and anxiety that I was dealing with because of everything that was – how my mind was working at work at that point. Diana: I think we kind of train ourselves to think that it’s working, so we think it works. And I even have had my own journey around alcohol that I had a particular summer, and it was a while ago, and I ended up putting on a lot of weight because of it. But it was a very stressful time with my family and we were all partying about it every 5:30 at the lake and that type of thing. And I put on more weight and I did not take it off until this year because I think I’d integrated this habit of using alcohol in a different way than I have in previous years, and then it just became a habit. So I had to really – I was like, what is different? And it was the alcohol. And I knew I was not feeling as well. But we think it’s working. We think, “Oh, this is making me feel better. I can handle it.” I thought I was eating healthy but I really was overeating because I actually don’t like to feel drunk, so I always overeat to soften that. So, how do we unlock this and why is it worth it? I think I’m asking too many questions, but what’s next? Do you see how this brings up so much, like, “Wait, how do I do this?” And I’m already doing it. I know that I am doing some of the things that you suggest. But if we think it’s working, why would we even be motivated to think about our overdrinking? Rachel: Yeah, well the thing that I always say is the most important thing is to really just ask yourself, do I like the results that I’m getting? Like, so often, what we focus on is how much I’m drinking. And so, all our attention gets really laser focused on the amount. But the fact of the matter is, you have to really just ask yourself, do I like the results? Because two glasses of wine on Monday may not feel the same as two glasses of wine on Wednesday. You’re in a different space. You’re feeling different. And when we just think about a number, it really disconnects us from our body. And that’s why I think this work is so powerful, the work around overeating and the work around overdrinking, because it really is asking you to reconnect with your body and reconnect with what does it feel like when I consume these things, what does it feel like when I consume things very quickly or consume a lot of it? How do I feel the next day? How do I feel immediately after? What’s my energy level like? Diana: Yeah, it feels so good at first, but it’s really just the brain, not the alcohol, right? Rachel: Yeah, I mean, I think that’s the important piece. You have to really understand, yeah, it feels so good because your brain is getting a reward and your brain was designed, it evolved to seek out rewards in the environment. That’s part of human evolution. But when you find that when you’re coming home from work and if you don’t open up the bottle of wine when you get home, while you’re cooking dinner, when you sit down for dinner, if you find that your anxiety and stress, it feels like there isn’t a way to manage it without it, then you have to kind of ask, is this the result that I like? Diana: So this is what I think gets so hard because, just like I teach people to stop overeating, because we have to eat, but how – and I think, when people look at alcohol, they look at it very all or none and they have a lot of judgments around, “But wait, I can handle my alcohol.” It really taps that almost cultural space, like what you spoke about, like we’re taught that you’re either an alcoholic or you just are really normal, but what about this in between when we’re feeling this destruction in our life or dependency on it, like I can’t go to a social event without a drink. How do we begin, once we realize we want to make a shift, how do you get started? So what are you making that mean when you notice that alcohol has become both something that maybe you use to take the edge off of stress or anxiety or insecurity, whatever it is, and also what do you make it mean if you find that you are struggling to figure out a way to change this? Because if you don’t look at that, I think it’s very, very hard to then go about changing. We’re so terrified it means, oh I’m just lacing discipline or I’m weak or something’s wrong with me or something’s wrong with my brain. We’re so terrified of what it means that a lot of times we just want to bury our head in the sand and just not look. So that’s one thing to pay attention to. The other thing that I have my clients do is what is it like to be really present with alcohol? And what I mean by that is to give your full attention to consuming it. What does that look like? Most people find, even when they say, “Oh I love it. This is my favorite drink. I love everything about it,” most people find that they’re really not present with the alcohol itself. They’re not really being mindful. In fact, a lot of times, when you’re drinking to take the edge off or feel less insecure, if you’re at a networking event, or to feel less stressed out when you come home, that you’re not really paying attention to the alcohol as much. You’re really kind of quickly consuming it because you really want to get to this other feeling state. And there’s a lot of amazing work that I think people are starting to become more familiar with around being more mindful around the consumption of food, but you can take all of that to the consumption of alcohol as well, to really sit down and be fully present with that glass of wine, what does that look like for you? A lot of my clients will tell me that, when they really do it, it becomes very frustrating because they notice their brain thinking, “I don’t want to be slow.” It’s the same thing. Like, I don’t want to eat the bag of chips one by one really tasting it. No, I want to inhale the bag of chips so I can numb myself. Diana: So I feel better, so the numbing happens. But I also think that there’s guilt. Like, I know, even you just posing it in this way, that if there’s any guilt, like from that first way you’re looking at it, what are you making it mean? And so this is like eating fast food. It’s like, why would I eat fast food mindfully? I’m like, but if that is your meal and you eat it mindfully, you will eat less and you will actually enjoy it. Like, at least enjoy it if you’re going to eat it. You’re eating it, it doesn’t matter. Being present with it, even that can help reduce overeating. No judgment about that what, just staying present with it. But I never thought about that with alcohol. It’s so fascinating when people are so sure that they love something, but then, when they actually bring their full awareness, their full attention to it, they discover, maybe I’m not really enjoying that second or third drink as much as I think that I am. Diana: Oh my gosh, and it’s so funny, Rachel, because I do this work at such a deep level with food and with my clients, and I do think, because I had my own thoughts about it, I really do think all or none with alcohol. And yet, I know, when I successfully lost weight 10 years ago, that one of my own ideas was I only drank really amazing wine, never on an empty stomach because I hated the quick. But I lost – I got in a fluffy habit with it of wind-down as I built my business. And it was just really interesting though that staying present with it is so powerful. It is so powerful with food. It’s so powerful with anything. But it’s fascinating. I had not even seen where I was seeing this, well I only drink one a week and then really enjoy it, but I don’t even know if I’m that present. It’s like, oh, I have permission tonight, am I really staying present with it? But this is – I mean, it’s true of food, it’s true of alcohol, it’s true of anything in life. If you are consuming something and doing it to feel differently, if you are using it to cope with your emotions, if you find yourself doing it incredibly fast, it doesn’t matter if it was $5 or $50, it’s not probably giving you a result that’s very good. Diana: Oh, I just love it. So the first step is really what are you making it mean, kind of seeing why, this story around yourself and alcohol, right? And then really paying full attention when you drink it. So it becomes this exercise in willpower. It becomes this exercise in, like, okay, I’ve made it through one day, I’ll make it through another. But here’s the thing; when you’re using willpower, when you’re counting days, when you’re just putting red lines through a calendar, you’re missing so much amazing information, amazing opportunity to understand what is truly motivating the habit, which of course is what you are thinking and how you are feeling. And so that is a place, if you can take even a very short break, like a five-day break is one of the very first things I have people do, if you can use that time not to just grit your teeth and white-knuckle it, you can actually start to get a window on how the habit is working, what thoughts are connected to it, what emotions are connected to it. And you’ll start to discover things like, “I deserve it, I’ve had such a hard day, everybody else is, why not? Who cares? One won’t matter? I’ll start tomorrow.” Or you’ll start to notice the low-level feelings that are with you all day long. Maybe it’s anxiety, maybe it is stress. Maybe it is scarcity. Whatever it is that is with you all day long that you get to the end of the day and you’re like, “I don’t want to feel this anymore,” that is such a powerful place to be in. but you can’t do that work if what you’re just doing is saying, “Alright, I did one day, I’m just making it to the next and making it to the next.” You use that break period really as a way to get a window into your own mind and how the habit is working. Diana: Yeah, it’s like people that do no sugar no flour and applaud themselves because they’ve white-knuckled, but don’t get the insight, don’t understand. That’s so different. And the analogy is so, so clear. And this is coaching that’s going on in our community, both the overeating and then the overdrinking. And I’m like, wait, why am I not seeing how powerfully clear this is? Rachel: I’m sorry, I think this is so funny because my clients are always like, “Listen, Rachel, it’s such a problem because my husband is drinking with dinner or my husband is not drinking with dinner, or my husband drinks a perfect amount.” Like, it doesn’t matter what the husband is doing. He’s like drinking too much, not drinking at all, or drinking just the perfect amount. And all my clients are like, “Listen, it really is the husband. That’s why I’m having such a hard time.” He’s the perfect mirror for you to get to see all your own thinking; all of the thoughts that you’re having that are keeping the habit going. Diana: Yes, and he’ll – because he asked me if I want a glass of wine, he’s just being gracious. And he’s like, “You haven’t been drinking wine. Did you want me to pour you one?” Does that have anything to do with my decision? And he does not care. He doesn’t care if we eat together at the same time. If I’m hungry at a different time – I’ve already learned this in other places of my life, so why would I make it mean that I wasn’t with him in the evenings if I wasn’t drinking with him? And so wine or alcohol becomes this kind of permission for us to stop everything else. And so when we take that out, a lot of women are like, “Yeah, but now I’m not having this moment to actually connect with my partner.” But that is actually so indicative of how your brain has basically – it’s basically like, go, go, go, go, go, get this done, be more efficient, cross this off your to-do list. And so, wine is the only permission that you’re giving to yourself to sit back and relax. And that, to me, when a woman tells me, “Well listen, Rachel, if I don’t have that glass of wine, it’s like I can’t just sit on the couch and do nothing.” But then that is actually the more powerful piece of information that we need to uncover and unpack. And why is that? Why is it that you don’t give yourself permission to just sit on the couch, to just stop, to just take time for yourself to just connect with your partner, to disconnect form work, to disconnect from your to-do list? Wine becomes kind of the only way that we’ll give ourselves permission. And then of course you don’t want to say, “Well no, I won’t have a drink,” because essentially what you end up saying to yourself is, “Well then I can’t relax.” And nobody wants that. Diana: Nobody wants that. No, and we’re craving that because of the business, because of like what you shared. And I think I had a thought and I hope this helps our listeners – because I feel like I’m being coached right now, Rachel, thank you – that I literally – and I watched this as you’re giving so many words to what I was experiencing – I thought that I would break the connection with my husband if I didn’t have – I’m very much into connection with other people. And I was afraid that if I did not join him in that time with also a drink in my hand that I wouldn’t be as connected. And how crazy is this, because I know, I have conversations with a fellow coach girlfriend, that I literally have to watch the depressive effect with alcohol because I sometimes get really moody, and I think it’s him. It’s disrupting my connection with him because of how it affects me. Rachel: Totally, and I think this is the thing. So we essentially outsource to the drink in our hand, and we start believing connection happens through alcohol. But here’s the thing; when you connect with someone, connecting, it’s a verb. You have to take action. You have to do something. You have to ask them questions. You have to listen. You have to talk. And of course, what happens is that we outsource it to alcohol because alcohol is a depressant and it quiets that part of our mind that is always kind of like, what’s on my phone and what do I have to do and could I really bring this up, do I really want to talk about this with him? It creates space for us to kind of bring down some barriers. Now, the problem is, when you feel like if you don’t have that buzz, if you don’t have that glass in your hand, you can’t sit down and relax and talk and ask questions and talk about real stuff. That, I think, is the really, really powerful piece here. Diana: Yeah, and I know that that was creating a disconnect for me and I was just creating the literal opposite with the alcohol. And it is that fear, like we won’t be connected, so I can’t say no even though I really don’t want to be drinking during the week. Like, I just knew that that was something I didn’t want to be doing. So, what are the benefits – I love talking about results that work when we get to the bottom of our own thoughts around alcohol and then get really present. This has really been a part of my journey. I think I would have asked you even sooner to be a guest I think, but I was having that discomfort around my own journey with alcohol. And now I have kind of started digging in and I’m realizing, the results are off the chart. Like, everybody talks about sleep, and very flippantly, you sleep better, this, this, and this. I have not felt better in my life in the last I would say 10 years as I do now and I know it’s that next level. I eat really well, I workout, that was the last place that I wasn’t really connected to my body fully. And now, my sleep is less hours, much more restful, high-energy all day, which I’ve always craved. And I’m like, what Why didn’t they tell me? Why didn’t you tell me, Rachel Hart? Why didn’t you beat me over the head and tell me to stop overdrinking, right? Because in many ways, for a lot of people, it’s very subtle. We think that, oh yeah, of course if you drink too much you get a hangover and you have a headache and you have an upset stomach and that’s what it’s like. But here’s what you have to keep in mind; alcohol is something that your body treats as a top priority. And what I mean by that is that when you consume it, your body stops doing everything else pretty much that it can do so that it can get the ethanol out of your system. So it puts digestion on hold, it puts other normal processes on hold, so it can just focus on dealing with the alcohol and getting it out of your body because it is a poison for your body. It has to be processed. The liver has to take care of it. and so what I think happens is that especially when alcohol just becomes this habitual thing of, of course I always have my nightly glass of wine or of course I always have it when I’m cooking or eating dinner, we start to, in the same way that we don’t notice many times the negative emotions that hang out with us all day because it’s just such a normal part of life, it’s the same thing with the physical side effects. And so, it really is – so many women will tell me, “I just thought that I felt this way. I just thought that I was groggy in the morning. I just thought that I was putting on extra weight. I just thought that my skin looked a little sallow. I just thought that was getting older.” We just think it’s getting older. And then, all of a sudden, when you give your body a break, when your body doesn’t have to go into kind of emergency mode every night and stop all other processes, all of a sudden, your body is like, “Oh, hi, I can turn to other things.” Because you are, of course, always needing, the body is always in a process of repair and renewal. And that process is interrupted by alcohol. And so there are so many benefits in terms of sleep, in terms of digestion, in terms of your skin, in terms of hydration, in terms of energy levels. But for so many people, they don’t even realize that they are at a deficit right now because they’re just chalking it up to, well I’m just getting older. This is just what happens. That’s a huge benefit that I think cannot be oversold, because who doesn’t want to feel better, right? Diana: I didn’t know until – and I didn’t even realize I was doing your process. Like, this came as my own idea. I’m just going to not be a weekday drinker. I just did not want to drink during the week. And then I realized I just don’t really care that much about it over the weekend. I allow myself to have it when I want it, but now, it is maybe once a week. Is that the process of taking a break and then making a decision about how you want to handle it going forward, what do you do for your clients there that don’t want to stop drinking altogether, they do want to enjoy it every once in a while? Where does that fit in? Rachel: I always say that the most important thing is that you are your own best authority when it comes to what is right for you. So I can’t tell anyone what is going to be right for them, what is going to feel good for them, what is a certain kind of magical number where you’re going to get the results that you want. You have to discover that for yourself. It’s learning all the time when it’s going to get a reward. So you have to start doing the work of retraining your brain around when it gets rewards, that just because you feel an urge, doesn’t mean you’re going to have a drink. That’s how the habit has been operating and how it operates when we get to that place of, like, hey how did I become a daily drinker? How did this become a part of every evening? Because your brain has gotten to a place where it’s like, oh, I just feel an urge and then I get a reward, and I feel an urge and then I get a reward. And if you head down that path, it will be a path that’s going to create problems for you. And so, the work is really, I think, a combination – sometimes it is that work of taking a break just to really discover, okay, what it is, how do I actually feel without it? Do I actually need it in the way I think I do with my husband or at work events or with my girlfriends, whatever it is? But I think the other piece is, if you’re going to have a concentrated reward, you have to plan it and you have to use a process that is very deliberate. And I’m sure that it is probably similar to some of the work that you teach your clients around eating sugar and flour. As soon as you start to really plan, it’s going to bring up, as I call it, the rolodex of excuses. Your brain’s just like flipping through that rolodex of – I love that idea because the brain is like, how about this one? Is this one going to work? Can we pull this card out? Rachel: It really is teaching your brain that you are drinking based on a planned decision, not because you feel an urge. And that’s what I think is so, at first, initially so uncomfortable for people, like oh I feel this urge and I’m saying no to it, and now I feel uncomfortable because my brain’s not getting a reward. But then your brain also has the whole story about what it means about this won’t be as much fun, I’m always going to feel deprived, I won’t be able to connect to people, I won’t be able to take the edge off, people are going to think that it’s weird. It brings up all this story and that really is the work. That’s really where you have to be doing the deeper level work is to understand what are the thoughts that are really fueling that habit. Diana: yeah, and the minute we feel that power that it is just a thought, it’s so fascinating, my thought that this is when I connect with my husband, not just I need this, but whatever it is that’s creating that routine and that habit. It’s food drama. It’s getting rid of the food drama. Now it’s just getting rid of the alcohol drama. Rachel: Totally, I love exploring wit women because this thought comes up so much, the thought, I deserve it; especially when you are smart and successful and you are a badass at your job and you are getting stuff done. You are working really hard, and that thought, I deserve it – and I think, for so many women, we just listen to that thought and we reward it with a drink or we reward it with food. And we never actually stop to consider what is the it in I deserve it. When you tell yourself, I deserve it, what are you really saying? And is it really Ben & Jerry’s and chardonnay? Is that really what you deserve in life? Or do you deserve something that is so much more than just sugary highly processed food and alcohol? We don’t even go into that. And having women explore, what does that mean for them – does it mean connection, does it mean relaxation, does it mean rest, does it mean fun? What does it mean? Because we just are in that place of, I just deserve it, and just listening to that thought without really doing the inquiry behind it. Diana: Oh, and there’s so much information there. And what I love, and you and I have the opportunity to watch this with our clients, but what I love is it can be as simple as joy. And it’s one thing that can come up for a client when we get in these conversations, what is the one thing? And as simple as getting, if it’s rest, one extra hour of sleep, as simple as, saying yes to activities with friends even when you have very little extra time in your life and realizing how much that lights you up. And it’s like, what we seek in food or alcohol is such a cheap imitation for the real thing. And it’s so simple and powerful to be choosing what our soul is really yearning for in those moments. Rachel: Yeah, because here’s the thing, there’s no amount of food or alcohol that will stop that yearning. It will never satisfy it because, like you said, it really is a cheap substitute because what you want and what you are searching for, it is deeper than that. It is deeper than a highly concentrated reward in your brain. And that, I think, is sometimes the kind of daunting piece. But listen, when you start to do that work, when you start actually creating a life – and this is what I think the work with overeating and overdrinking, what it really is a pathway for, it is about creating a life that really blows your mind, where you really get to not just yearn for things, not just have all these longings or these parts of you that feel unfulfilled, but actually going and creating. That’s when you turn around and you’re like, “Oh yeah, I definitely do not need a glass of wine to make this better. I definitely do not need a bag of chips to make this better,” because your life itself is so much better. You know, it’s like, go make your life amazing. That then really is the very best solution and it can be very daunting. But this is what the work that all of your listeners, all of the women that you work with, this is the work that we’re teaching ourselves how to do, is how to go make our life amazing so that we’re not spending all this time thinking about what we’re eating and thinking about what we’re drinking and feeling crappy about the results that we get. Diana: Yeah, and I serve business owners and I see where they’re frustrated with the results they’re getting in their business and where this piece is the distraction, that the creativity, the vision-making – and it starts with the stress of hustling and growing in a business but then coming to this place where alcohol and food were used to feel better and it’s robbing them of continuing to be that visionary and be that creator that brought them to that success in the first place. Rachel: I always say that when you do this work to really, really take out food and alcohol as things that you over consume and you use to manage your emotions, what it does – yes, you’ll see a change in the scale, yes you’ll feel better when you wake up in the morning, but what it actually does is it creates white space in your life because you had all this mental energy going to what am I going to eat, what am I going to drink, why did I eat that much, why did I drink that much, oh my god, am I ever going to fix this out? You have all this mental energy going towards these negative results. Rachel: Of course, right? Once I didn’t have that as the thing I had to worry about anymore, it was like my brain had the freedom to think big again and to have dreams and visions and be creative. It didn’t have the space to do it when all my mental energy was trying to clean up what I did the night before. Diana: And I will never forget how I was introduced to you and it always has gotten my attention and I feel like this is a way to really close, when Brooke went and did a 180 and looked at you and said, “What did you say? That life is better without chardonnay? How can that be?” And you just answered that question. It does seem impossible. It seems – I think it’s the white space thing that you talked about. And I feel like this will help close it up. When clients come to me – and I know when clients come to you – they don’t feel like they have the bandwidth to even handle what they want to change. Like, how can I even lose weight? How can I even think about working on this? But in the result, what it does when we work on it and start paying attention to our real and amazing lives, it creates so much energy, and like you said, this capacity for creation and calm and all the things we’re craving. We think we can’t relax and it creates that space that we can finally start relaxing and having margin. It’s so unexpected, I think, but it’s the miraculous result of doing the work around this. Rachel: Yeah, people are terrified of what’s going to happen when I don’t have the plate of pasta or the ice cream or the chardonnay. Like, what’s going to happen if I don’t have that in my life? We’re so attached to it. But the fact of the matter is, when you really are able to manage it, when you’re really not feeling like that is the best part of your day, that’s when your life blows up. That’s when it becomes so much bigger and better and more amazing. I always think this, like, I couldn’t have even dreamed of where I am right now. It just didn’t even seem possible. That’s when things really take off and that’s the power of this work. Diana: Yes, I’m seeing it in my life and I’ve seen it in yours and in Brooke’s the examples that we have, and I’m seeing it in my clients that, when they had one night a week to themselves and they were spending it alone and overeating instead of going out because they felt like they didn’t have time, and the made that trade, that gave me – well food gives me joy – and now they’re lighting up their lives with, you know, things that they love in their lives and now they’re rested when they go back to work. They’re restored. It is just fascinating, that cheap replacement that food and alcohol have become in our society. And you have the answers, you really do. Take a Break is something that people can opt-in on, is that right? Rachel: Yeah, so I actually have a Five-Day Reset on my website. So, if you go to rachelhart.com – so it’s actually a five-day video series that will help you take a break, but again, it’s not about crossing days off a calendar. It really is about starting to examine the habit from a very, very different perspective. I think that’s a fantastic place for people to start. Diana: Oh great, I’m so glad you have that. And I do want to spell, for those that don’t go to the show notes, but this will be in your show notes, but Rachel’s website is rachelhart.com. But it will be in the show notes and if anybody’s listening and forgets it and wants this resource, just email me, diana@dianamurphycoaching.com. Do you have anything else you want to share, Rachel? This has been so much fun. Rachel: I know, I’ve loved doing this. I mean, I really think that this is the way that we unleash women’s potential. And all of the ways in which we beat ourselves up and we feel like we’re never going to figure it out and am I always going to overeat and am I always going to feel like I need a drink in a social situation, you know, this is really how you take your potential and actualize it. And that’s what I think I so powerful about the work that we do. Diana: I agree, and I serve both men and women, but uniquely business owners. And I have not met a more overwhelmed group of people and there just doesn’t seem to, like, how can I do more? How can I be with my family more? How can I, in this piece of really getting to the bottom of how they’re taking care of their wellness, is absolutely the ticket? It is just insane. And I just wanted to lose weight just to lose weight when I first started this. I had no idea what – I should be taking care of grandbabies – there aren’t any yet – but I am an empty nest woman and I have started a new business and you are a new mom. How old is your new baby? Diana: Seven months old, and yet you’re rocking this huge coaching practice and serving so many. It is just fascinating what is so possible when we get to the bottom of what’s frustrating us in our lives. Thank you so much, Rachel. I really appreciate your time and I can’t think of a better way – you will be the first broadcasted interview. I’ve recorded a few others, but you’re going to be my first broadcasted interview on my podcast and I want to thank you for making the way. This was a very good way to start. Rachel: Awesome, well thank you so much for having me. I love talking about this work and I love giving people a new perspective to think about why it is that they drink more than they want. Diana: Yep, and you’d think as a fellow coach that I knew everything, and I needed your insight today, so I really, really appreciate it. I know my clients and my listeners will really enjoy this show. So I’ll be suggesting it. Awesome. Diana: Alright, Rachel, have a great day. Diana, I have been listening to your podcast series and loving it! I appreciate your calm voice, humor, real examples and tidbits that make sense and are easy to implement. It is perfect for the business owner strapped for time!